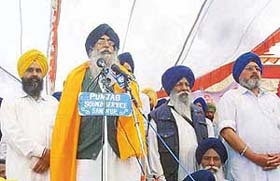 Mr Parkash Singh Badal former state Chief Minister and SAD Chief has flayed Mr Inderjit Singh Zira, a former minister, for raising hue and cry due to denial of party ticket to him for the Ferozepore Lok Sabha seat. Bahujan Samaj Party leader Ms Mayawati said today that the BSP would “choose” only that political party for poll alliance which, would “practically” ensure the transfer of its votes to the BSP and a decision on alliance might be announced by the party within three or four days after reports from different state units. 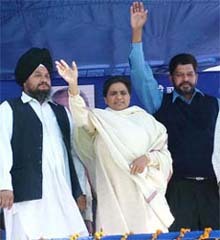 Mayawati acknowledges the greetings at a rally in Jalandhar on Wednesday. Announcing the stand of Shiromani Akali Dal (Amritsar) on the issue of religious fanaticism, Mr Simranjit Singh Mann, President of the party today said that his party did not believe in religious fanaticism as it was damaging to the country and society. 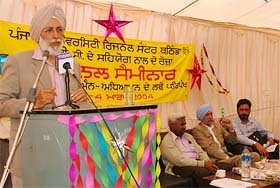 Mr Simranjit Singh Mann, President of SAD (A), addresses a rally at Sangrur on Wednesday. To encourage the sale of beer in the state, which had witnessed a sharp fall because of its high price tag, the state government, has decided to introduce beer quota system, wherein, one crore bulk litres of beer would be sold throughout the state during the next financial year. The Panthic Parliamentary Board, a conglomerate of splintered Panthic outfits, today declared to field its own candidates and support the like-minded candidates in the forthcoming Lok Sabha poll. On February 26 at 9 pm, a 43-year-old Sikh of medium-build, stepped out of Delhi’s Tihar Jail having earned a 14-day reprieve after 17 years of imprisonment to see his ailing mother, afflicted with cancer. 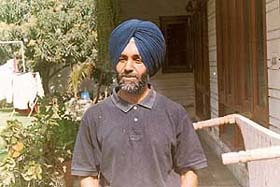 He was Ranjit Singh Gill, sentenced to life imprisonment in the Lalit Maken assassination case. Son of Dr. Khem Singh Gill, former Vice-Chancellor, PAU, Ranjit spent almost 14 years in prison in the USA. From “Kaali Aandhi”, on which the film “Aandhi” was based, to his recent publication “Kitne Pakistan”, which asks how many divisions a civilisation can sustain, Kamleshwar has stood fast to his values — writing on issues which concern his culture and deriving strength from it. Local youth Congress activists today criticised the appointment of Mr Ravinder Singh Amla as president of the Punjab Youth Congress and appealed to Chief Minister Amarinder Singh and Punjab Pradesh Congress president H.S. Hanspal to “rectify” the mistake in view of the forthcoming Lok Sabha elections. Two sets of rules for poachers? Two newly appointed enthusiastic wildlife wardens who caught a Subdivisional Magistrate poaching in Naroor forest on February 29 must be wondering about different sets of rules applicable for shooters of national bird and other Schedule I fauna of the State. Mr Sanjay Popli, Additional District Magistrate, Ferozepore, has recommended legal and departmental action against Ms Taro Bai, Child Development Project Officer, Jalandhar, for her alleged involvement in the pre-school hits scam, which had come to light in September 2003. The Punjab State Human Rights Commission has sought a report from the IG, Police (Litigation), and the SSP, Sangrur, on a complaint lodged by a resident of Malerkotla that he and his family was being harassed by the police at the behest of the family of a girl who, he claimed, was the wife of his brother. The high handedness of the police today came to the fore when a group of Punjab Police commandoes resorted to cane charge without any provocation on residents of the local Adarsh Nagar and adjoining localities. The residents were demanding removal of barricades from the Chick Chick chowk crossing here. Leading cine stars, including Dev Anand, Kamini Kaushal, have been invited to participate in the 140th foundation day of the famous Government College, Lahore. This was revealed by the 11-member delegation of Old Ravians who crossed over to India here today. For the first time after Partition, Punjabi artistes from India would present a Punjabi play ‘Luna’ in Lahore (Pakistan) on the occasion of Women’s Day. The play would be performed from March 7 to 13. Pilgrims from all parts of the state have been coming to Kiratpur Sahib and Anandpur Sahib to pay obeisance at religious places, including Takht Sri Kesgarh Sahib for six-day Hola Mohalla celebrations that began here yesterday. The FCI’s Executive Staff Union and other bodies affiliated to it have served notice on the management for an agitation from March 19 in support of their demands. The reported move by the state government to withdraw ‘minority status’ from the SGPC-run educational institutes has come as a rude shock to the Shiromani committee. Tension arose when a move to shift Shri Guru Granth Sahib from a gurdwara near Basanwali Chungi to another gurdwara was scuttled by some persons here today. As the move turned violent, some received minor injuries. Industrial Services International, an NGO, today organised a skilled-based Entrepreneurship Development Programme at Baran village (Patiala district) and Jakhwali village (Fatehgarh Sahib district) here. The Punjab and Haryana High Court today fixed March 10 as the next date of hearing on a petition challenging Punjab Chief Minister Amarinder Singh’s election from the Patiala Assembly constituency. The Deputy Commissioner, Mr. S.K. Ahluwalia, has suspended the readers of the SDM and the tehsildar and recommended the suspension of a court clerk of Municipal Council, Sirhind-Fatehgarh Sahib, on the charge of dereliction of duty. Business rivalry among two shopkeepers of the local Punj Peer area today turned into a clash, which rendered four persons injured, while causing panic among the residents following firing of shots in the air by one of shopkeepers. Three persons were killed and four others were seriously injured when a van in which they were travelling collided with a tipper coming from the opposite, direction near chhatwal village about 10 km from here. A youth, who had been harassing a girl of a nearby village, was unmasked with the Helpline of the Patiala Police. He was later taken in police custody. The Superintendent of Police (Headquarters), Mr L. K. Yadav, said a girl from a village, near here, complained to the police that she was being constantly harassed by a boy who had been making anonymous calls at her residence. Jagwinder Singh and his son Gurinder Singh, alias Sunny, local cable operators of the Shakti Nagar area, have been booked on charges of duping students on the pretext of getting them admitted to foreign universities and colleges. One person Sukhdev Singh died on the spot while three persons seriously injured when a truck loaded with cement bags rammed into the oil tanker in which they were travelling near the Lehra Mohabbat thermal plant on Bathinda-Rampura road late last night. The in-laws of Vinod Kumar allegedly poisoned him to death here late last evening. The police arrested all accused and registered a case under Section 302 of the IPC at Islamabad police station here today. Dr S.S. Boparai, Vice-Chancellor, Punjabi University, Patiala, said today that computer education would be made a compulsory subject for BA course from the next academic session. Dr S.S. Boparai, Vice-Chancellor, Punjabi University, Patiala, addresses a seminar at the regional centre of Punjabi University in Bathinda on Wednesday. Students of the engineering colleges affiliated with Punjab Technical University today organised a rally and a dharna here to protest against the non-implementation of the 24-credit system. Dr H.P. Sinha, Programme Director and Executive Secretary of the Indian Society for Technical Education, New Delhi, has underlined the need for setting up more technical institutes in public and private sector to meet the challenges of advanced technology. Issues related to displacement, resettlement and rehabilitation of people due to big development projects have been a cause of concern for policy planners. Accordingly, study of such themes has been increasingly in demand. The Forum for Educational Action and Reform has urged the University Grants Commission to inculcate academic qualifications with experience in educational institutions for the post of the Vice-Chancellor in ‘The Model Act for universities of 21st century in India’ as done in other academic posts of the varsity here today. Eminent scientist Prof M.G.K. Menon has emphasised the need for greater interaction between the industry and the academia to ensure better self-reliance in the country. He observed that it was necessary to bring the science and research out of the laboratories into the practical field. The district police in collaboration with social organisation National Science Research Institute organised an interaction with students of various schools at MG College grounds here yesterday.